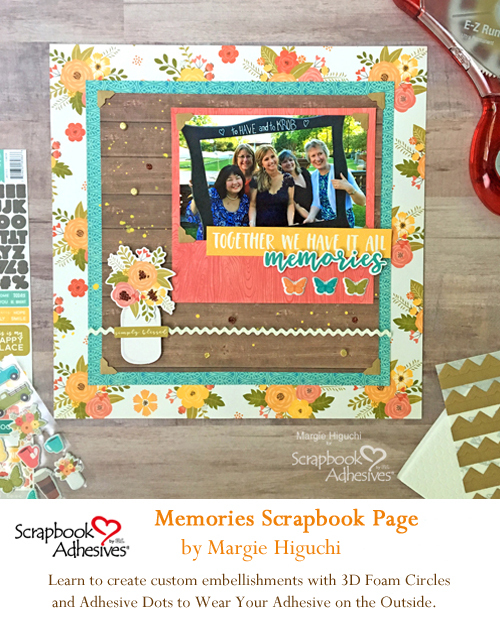 We love the farmhouse style and so does Margie Higuchi as she created her sweet Memories scrapbook page using the Farmhouse Stew Collection. 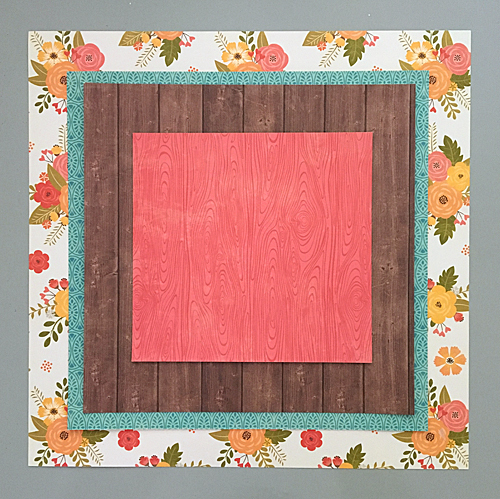 For Day 4 of our Blog Swap Week with Jillibean Soup (JBS), both design teams inspire us all. Take a look at JBS blog and both our Instagram accounts for more and giveaways too! Stay with us till the end for details. Let’s take a look at Margie’s page! 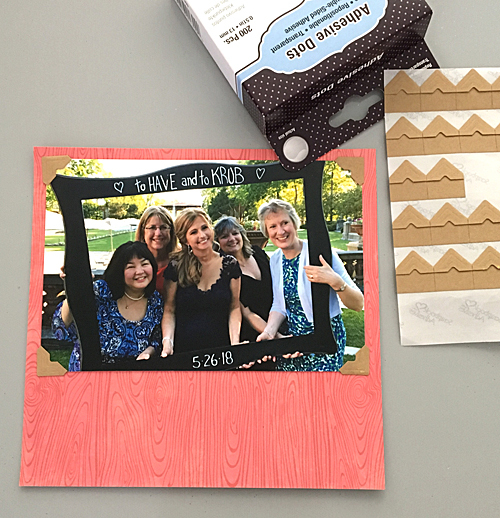 Using the Farmhouse Stew Collection from Jillibean Soup, I have created a sweet scrapbook page of my college friends at a recent gathering. This was so easy to create because the collection pack had everything I needed. Let’s start with my foundation which is the three different patterned papers I used for my layers. 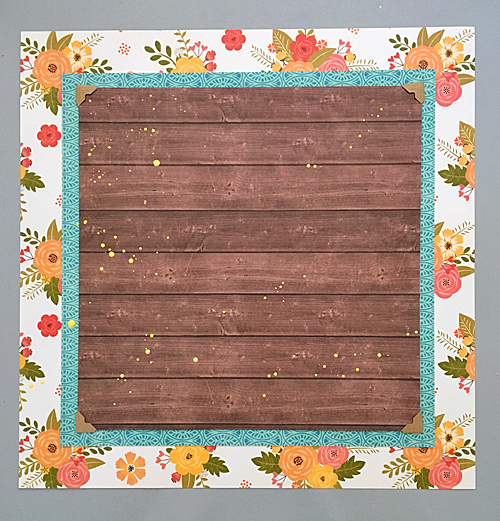 The Gimme Some Sugar patterned paper was my 12 x 12 inch base, cut Hold Your Horses patterned paper (blue) to 9 3/4 x 9 3/4 inches, Bless Your Heart patterned paper (brown) to 9 x 9 inches and lastly, cut Gimme Some Sugar patterned paper (red) to 6 1/2 x 6 1/4 inches. Replace my E-Z Runner Grand Refillable Dispenser Cartridge with the E-Z Runner Grand Ultra Strong Refill. See a quick tutorial on How to Use and Refill E-Z Runner Grand Dispensers video below. 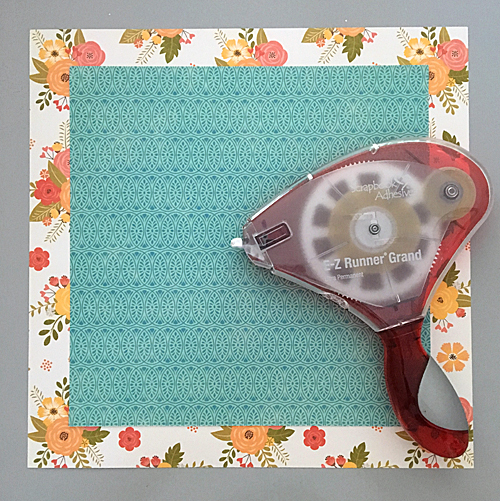 Since there will heavy layers and embellishments, I choose to use the E-Z Runner Grand Refillable Dispenser with the E-Z Runner Grand Ultra Strong Refill to adhere my Hold Your Horses patterned paper (blue). 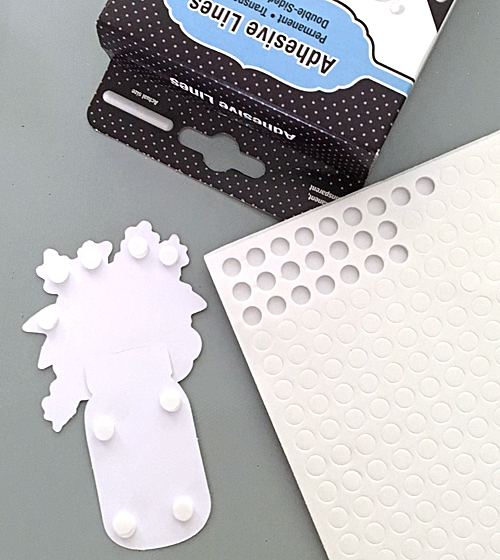 This product is perfect for a strong hold and I use it a lot for other paper construction such as envelopes, bags, boxes, etc. 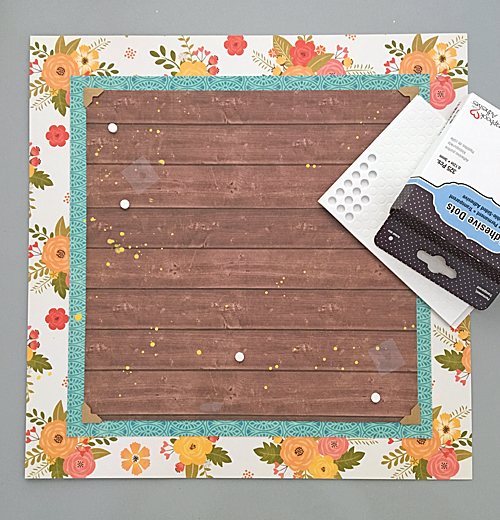 For the second layer, I placed a Creative Photo Corner Kraft for each of the corners of the Bless Your Heart patterned paper (brown) before centering and adhering with the E-Z Runner Grand. I wanted to create some interest on the page so I added splatters. 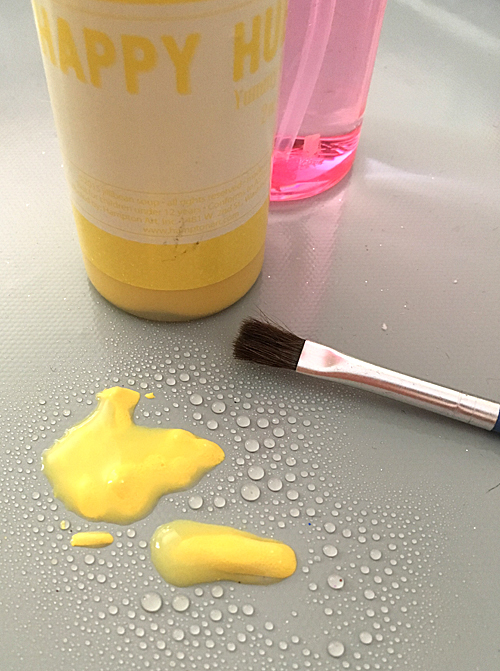 Using a mix of Happy Hues – Yummy Yellow and water, I lightly flicked with a small brush around the left side and bottom of the Bless Your Heart patterned paper (brown). Set aside to dry. 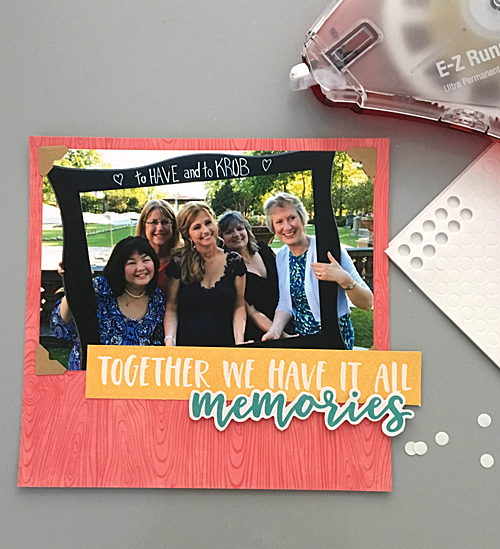 While the paint splatters are drying, I added my photo to the Gimme Some Sugar patterned paper (red) with a combination of Creative Photo Corners Kraft and Adhesive Dots Large Repositionable. If I needed to scan or share the original, I can easily remove the photo from the page. Punch out a sentiment from Farmhouse Pea Pod Parts (die cuts) sheet, apply a strip at the bottom with E-Z Runner Grand Ultra and place below the photo. 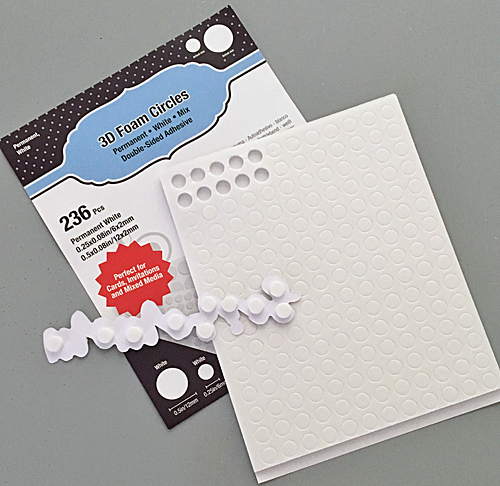 Punch out “Memories” from the same sheet and give it a pop with 3D Foam Circles White Mix Small Size. Adhere below the sentiment. 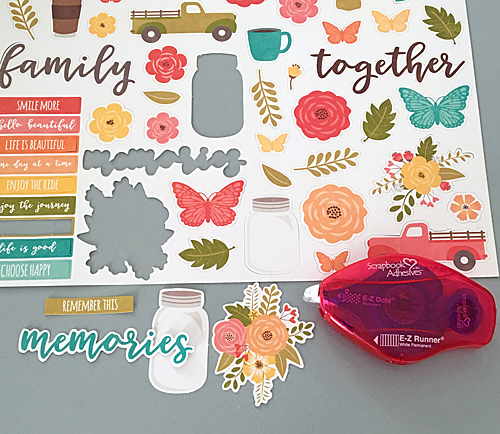 Lastly, add three puffy butterfly stickers from the Farmhouse Stew Puffy Stickers set below the Memories die cut. Set aside. By this time, the paint splatters dried but I wanted a little more interest so I decided to use a combination of 3D Foam Circles White Mix Small Size and Adhesives Dots Micro to “WEAR YOUR ADHESIVE ON THE OUTSIDE” with glitter and glittered embossing powder! Yes, both are heat resistant and are so much fun to create! Let me show you how. Three 3D Foam Circles White Mix Small Size were placed randomly on the Bless Your Heart patterned paper (brown) and then I added in my four Adhesives Dots Micro. 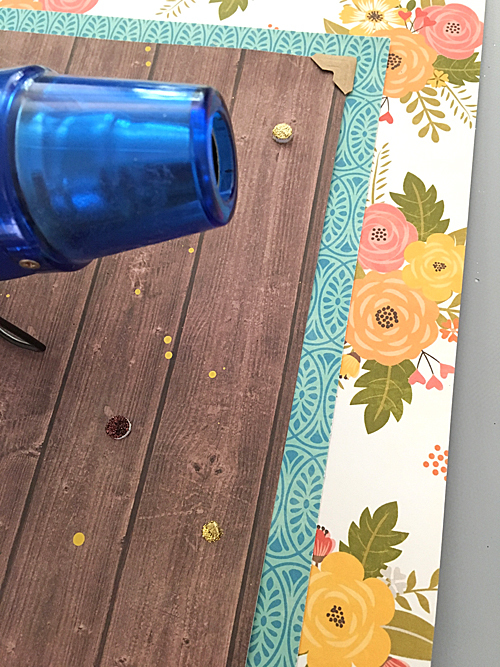 Note: I used my embellished photo mat as a guide…didn’t want any of the dots to be blocked. 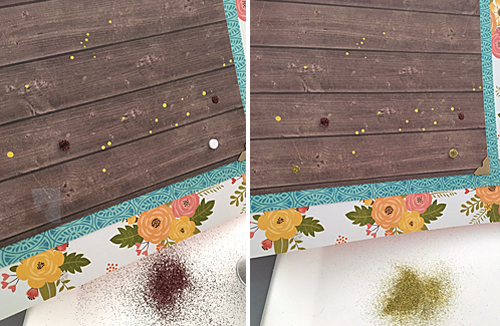 First I started with the glitter – just sprinkle over whichever dot or circle you choose, press it in to secure and tap off the excess. 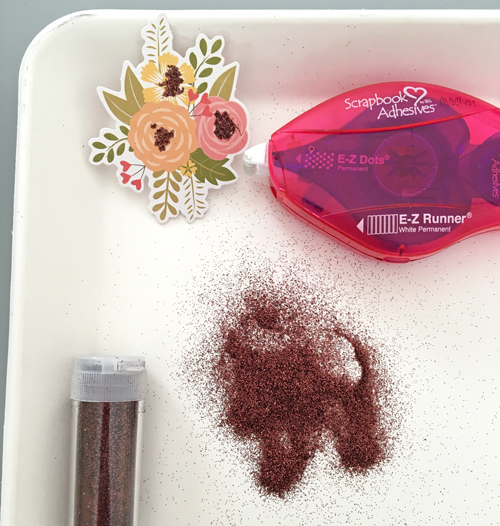 For the glittered embossing powder, repeat the same steps but at the end, melt with the heating tool. A close up of the brown glittered 3D Foam Circles White Mix Small Size and two of the heat embossed gold dot and circle. Love how they retained their shape under the heat! To continue with “WEAR YOUR ADHESIVE ON THE OUTSIDE” I wanted to share an embellishment I enhanced the flower bouquet die cut from Farmhouse Pea Pod Parts (die cuts) sheet. 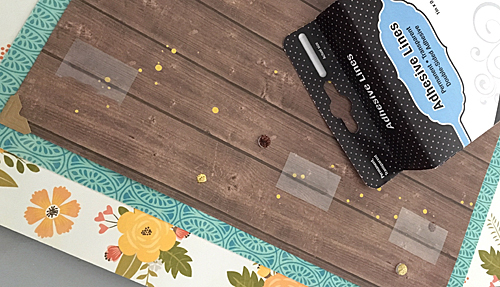 By applying E-Z Dots Permanent to the centers of each flower and sprinkling the same brown glitter. Then I continue to assemble a sweet bouquet in a glass jar. I used the Adhesive Lines to put the jar and bouquet die cuts together and then added 3D Foam Circles White Mix Small Size behind both. They will adhere on top of a 9 3/4 inch piece of rick-rack trim going across the layers of the page, secured with the Adhesive Lines. 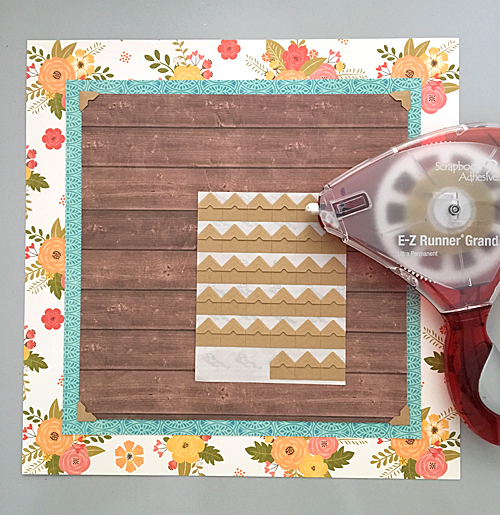 Lastly, adhere the embellished photo mat with E-Z Runner Grand Ultra Strong and you are done! 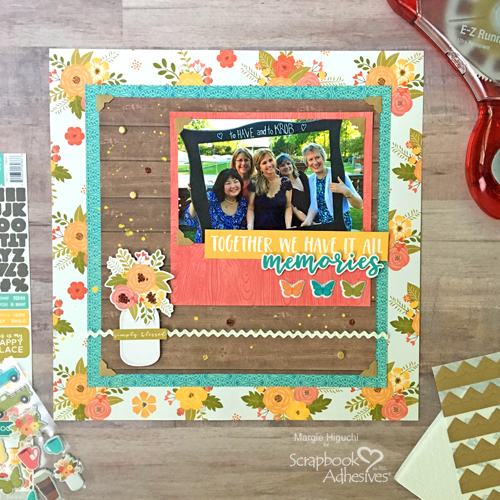 Here’s another look at the finished Memories Scrapbook Page! Missed out on any of the other Blog Swap Days? No worries! For Day 1, CLICK: Color Full Week with Jillibean Soup. Day 2: Creative Bohemian Vibe and Jillibean Soup. Day 3: Notepad Gift-ables and Jillibean Soup. 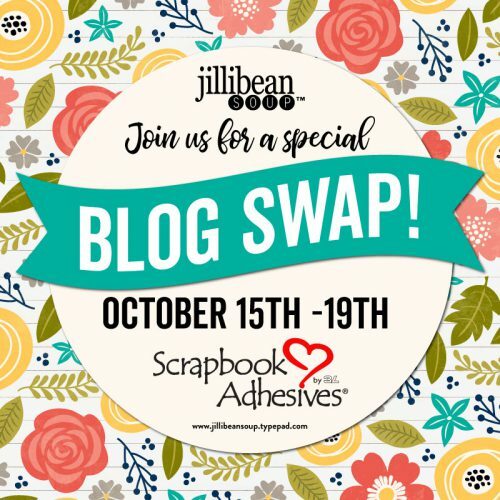 Blog Swap Week with Jillibean Soup Designs – Day 4. This entry was posted in 3D Foam Circles, Adhesive Dots & Lines, Adhesives, Announcement, Crafts & Tutorials, Creative Photo Corners, E-Z Runner® Dispensers, E-Z Runner® Grand, Embellishments, Intermediate, Permanent Adhesive, Repositionable Adhesive, Scrapbook Page, Scrapbooking, Skill Level, Tutorial, Wear your Adhesive on the Outside and tagged 3D Foam Circles White Mix, Adhesive Dots Large Repositionable, Adhesive Dots Micro, Adhesive Lines, Blog Hop, Creative Photo Corners Kraft, Creative Photo Corners Mix Pack, E-Z Dots Permanent, E-Z Dots Permanent Refill, E-Z Dots Permanent Refillable, E-Z Dots Refill Value Pack, E-Z Runner Grand Dispenser, E-Z Runner Grand Ultra Strong Refill, Giveaway, Instagram, Jillibean Soup, Margie Higuchi, Scrapbook Page, Wear Your Adhesive on the Outside. Bookmark the permalink.